The University of Dundee has a reputation as one of the leading universities in Scotland and consistently ranks among the top in the world according to publications such as Times Higher Education. Dundee’s undergraduate and postgraduate programs provide students with a comprehensive education in theory and practice, preparing students to enter their professions as soon as they graduate. The University of Dundee approached DesignedUX to increase Canadian awareness and enrollment in their Dual Qualifying English/Scottish LLB and postgraduate programs in science, engineering, and management. To achieve the university’s goals, we prepared a comprehensive digital and traditional campaign targeting recent alumni and upcoming graduates of select undergraduate programs in specific metropolitan areas across Canada. Acting as a representative of the University of Dundee in Canada, we set up information booths at universities across the country to talk directly with prospective students. Leveraging our relationships with these institutions, we were able to promote our presence in advance through social media and department emails. 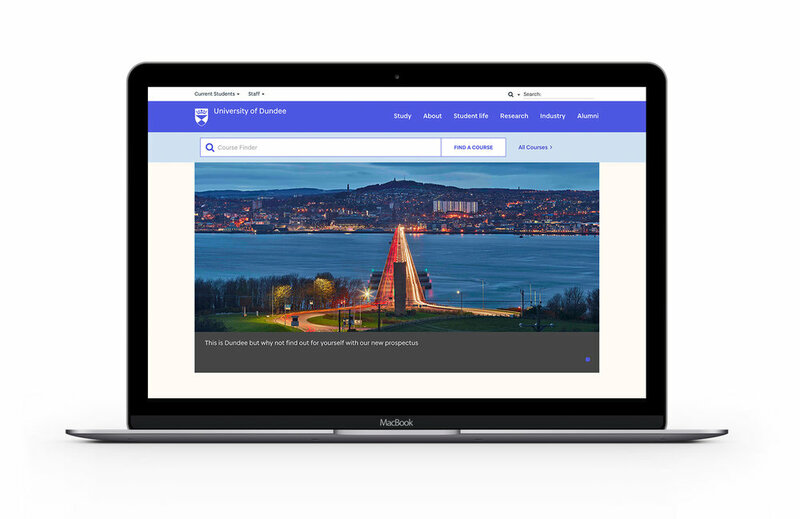 Partnering with Canada’s most popular online job board and graduate school resource provider we developed a comprehensive email and social media campaign, reaching over 25,000 recent graduates and directing them to a dedicated landing page for the University of Dundee.